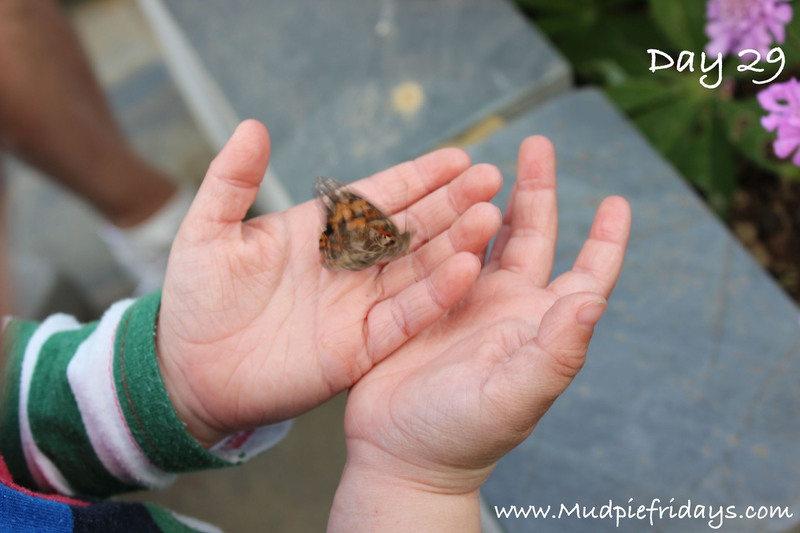 One of Monkey’s favourite books is The Hungry Caterpillar and he loves going to see the butterflies at RHS Wisley in the springtime. 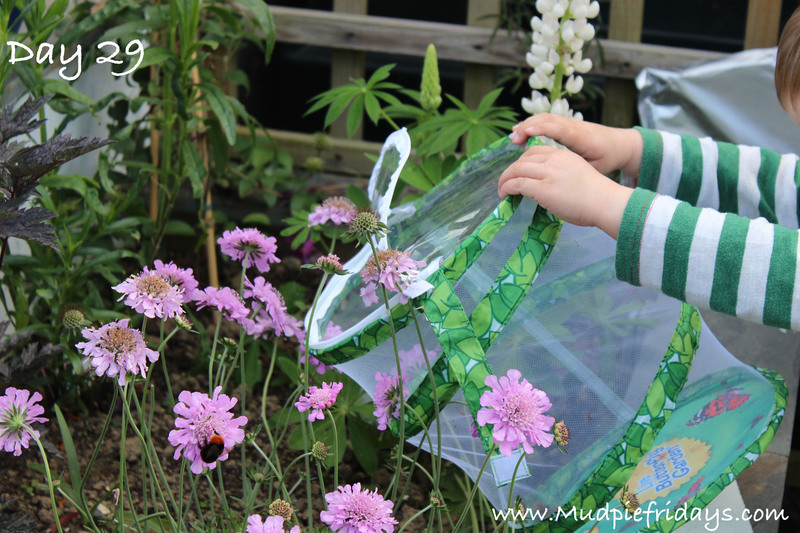 So when I found out we could effectively ‘grown our own’ via a company called Insect Lore that specialise in butterflies by mail it seemed obvious to do just that. 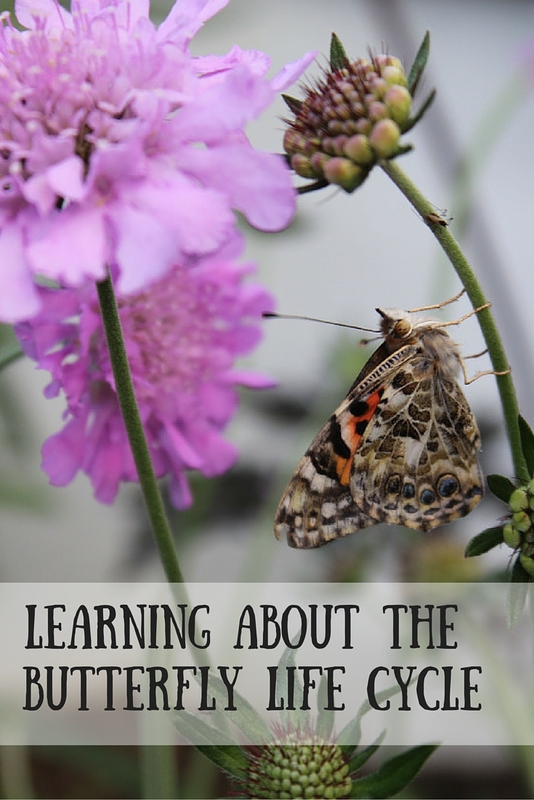 This post will be about the journey of our butterflies from the small little black caterpillars below to their release into our garden. We received ours on the 14th of May. Insect Lore were very good as I initially requested that they be delivered just before our holiday (school girl error) and changed the date without any problems at all. 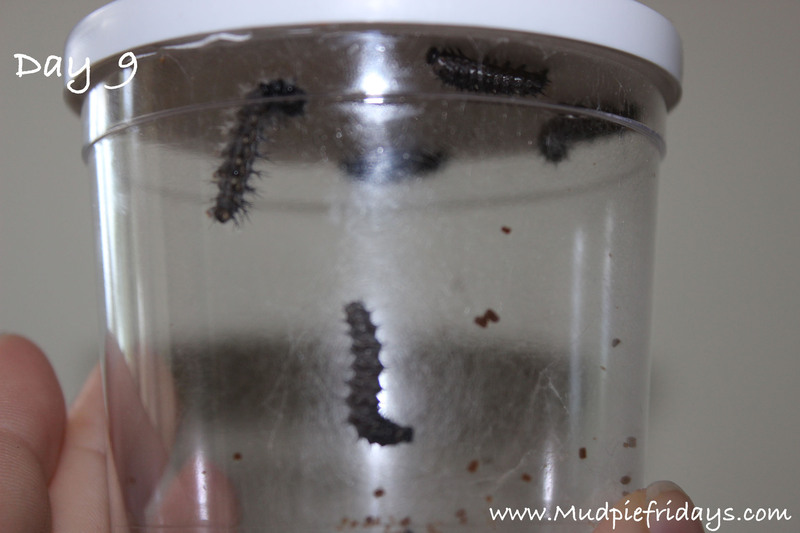 They also offer a guarantee should less than three of the five caterpillars make it through to beautiful butterflies. 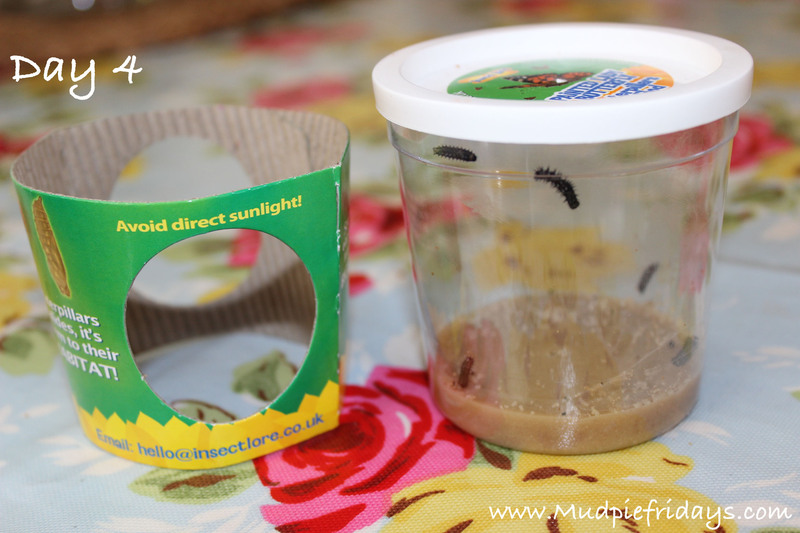 When we first received them they weren’t moving very much if at all – but this is normal and the instruction leaflet that comes with the caterpillars explains this. All the food and moisture that they need is included in the jar they come in so its very low maintenance at this point at least. They also come with a little cardboard sleeve to help regulate the temperature, as they shouldn’t be placed in direct sunlight. Depending on where you place them in your home if it gets cold at night they also recommend placing the cup in a blanket as temperature should really be between 21 and 26 degrees. Ours are living on the kitchen sideboard at the moment which is perfect as it means Monkey can reach them to observe anytime he likes. As its right next to the kitchen table they often join us at meal times too, and have become a real talking point. We are now on Day 4 and they are really starting to grown and move around a lot more. A couple of them have started to look very fluffy and measure a good 15mm now when fully extended. Although it is hard to measure them when they are moving around so don’t hold me to that. From the information leaflet this stage can take 7-14 days depending on the temperature. 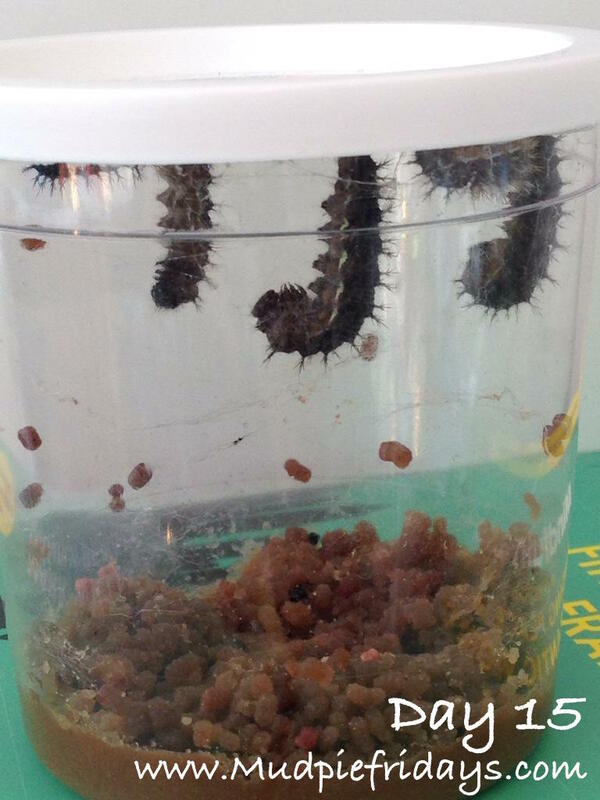 The difference from day 4 to day 6 has really surprised me they are much hairier now and getting fatter by the day just like in the Hungry Caterpillar! Monkey has been staying with his grandparents for a couple of nights due to work commitments so it will be great to see his face tomorrow when he comes home and sees just how big they have got. They are now around 350mm and they are starting to shed some of their skin, so much so that Monkey started to think their heads were falling off – it did make me laugh! To be honest though when you see the little black lumps they do look kind of round so I can see where he is coming from! Being a boy it didn’t seem to bother him at all. 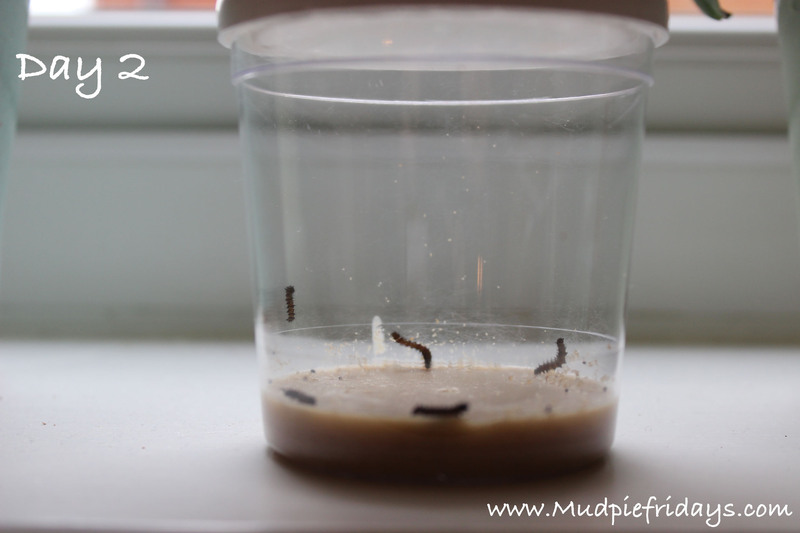 With the Bank Holiday weekend we have been away from the house for a couple of days so when we got back and found the caterpillars now easily 500mm long and quite thick around 5mm – it was a bit of a shock! I decided it was time to try and speed things up bit and perhaps it was a little cool for them in the kitchen. So for a couple of days while I was working in the conservatory they joined me. Although they were not in direct sunlight as this is not very good for them. The extra heat had the desired effect and they seemed to double in size almost over night. Then the following morning we came down to three of them hanging in ‘J’ shapes getting ready to turn into chyrysalides. We now had to start to be really careful as Monkey was fascinated by them but as they are starting to become delicate and I didn’t want him gabbing the jar at this important phase. 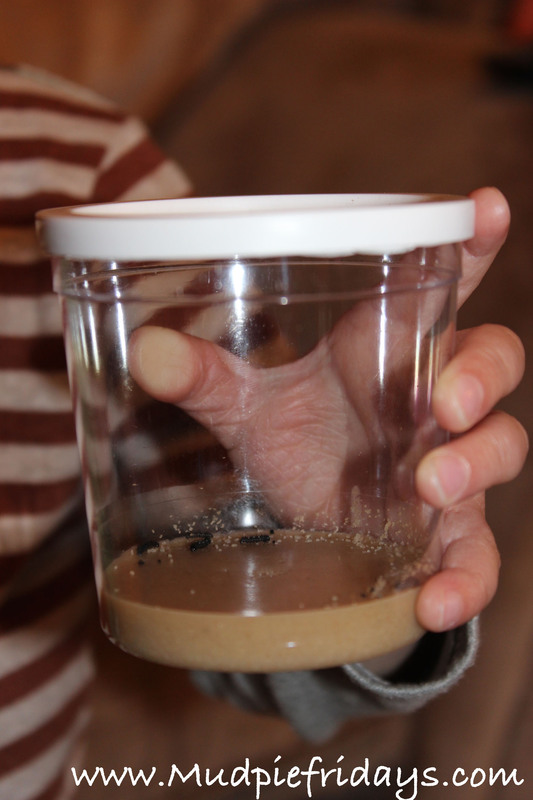 The information actually says you should avoid handling the jar once this transformation starts for three days to make sure that they have the chance to harden off. 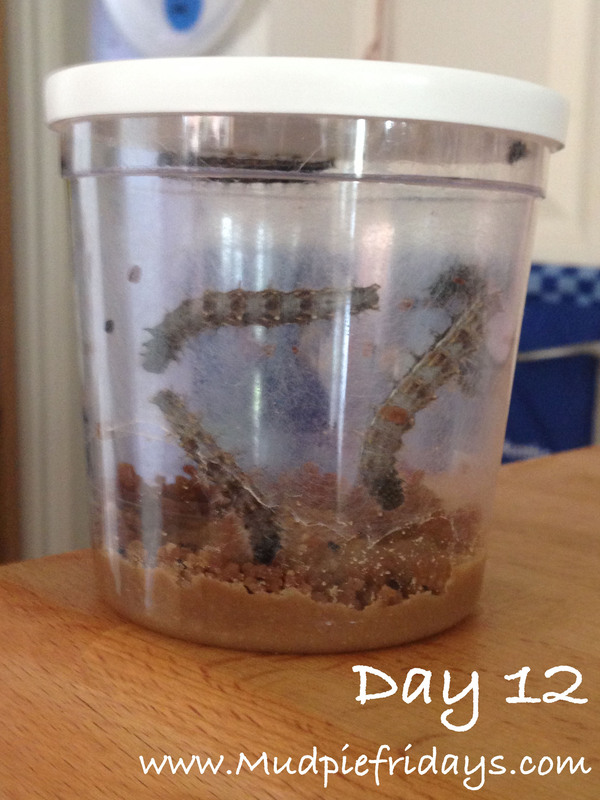 It took a further two days before all of the caterpillars had completely turned into chyrysalides. I must apologise for the bad photo below, but I didn’t think about photo opportunities when I moved them for the harding process! 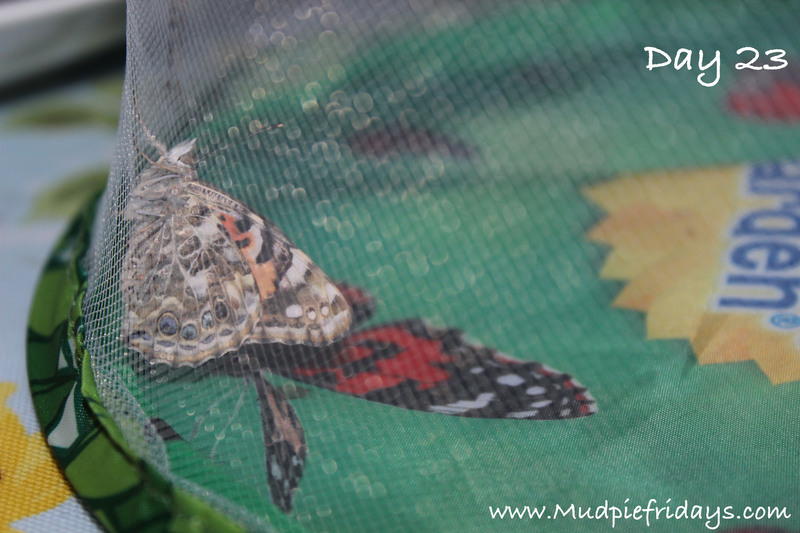 The butterflies moved into their new home in the net a couple of days later so that we were sure that they had fully completed the hardening process. Where they had attached themselves to the paper disk in the lid it was an easy process to move and using a safety pin attach them to the side of the net about 4cm from the bottom of the net. 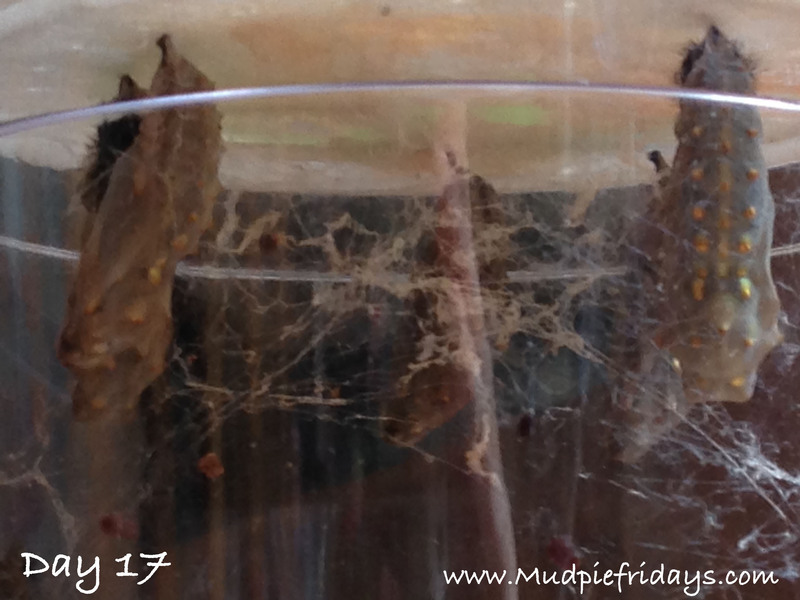 The butterflies emerge from the chrysalides in 7-14. They are living on our kitchen table at the moment – although I am little worried about the cold snap we have had the last couple of days. 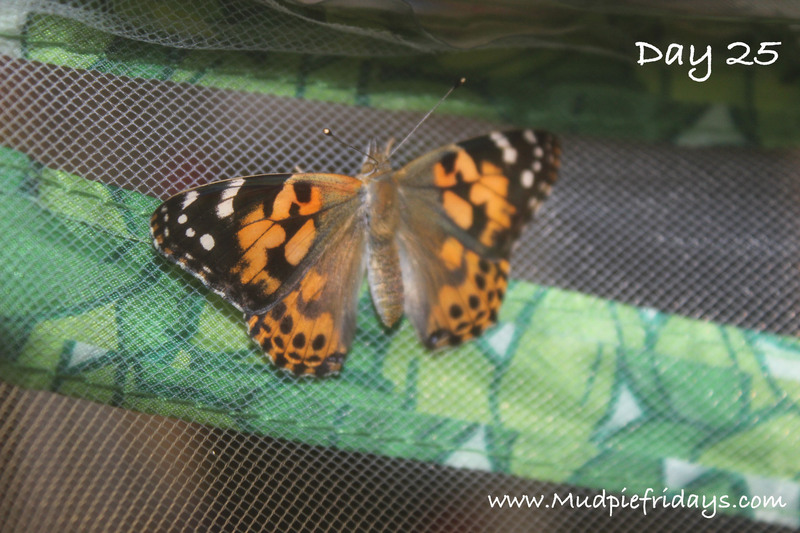 8th June – We have butterflies – I came home from work this evening to two butterflies attached to the side of the net vibrating gently drying their wings. There was also some red liquid on the paper – if I hadn’t read the instructions I would have been a little concerned but its excess liquid used to expand their wings so perfectly normal. It is very important that the new butterflies are not touched either as they emerge or just after. Monkey was very excited when he came home, however as we had been at work we have not idea how long they have been out so we didn’t want him touching them in anyway at the moment. 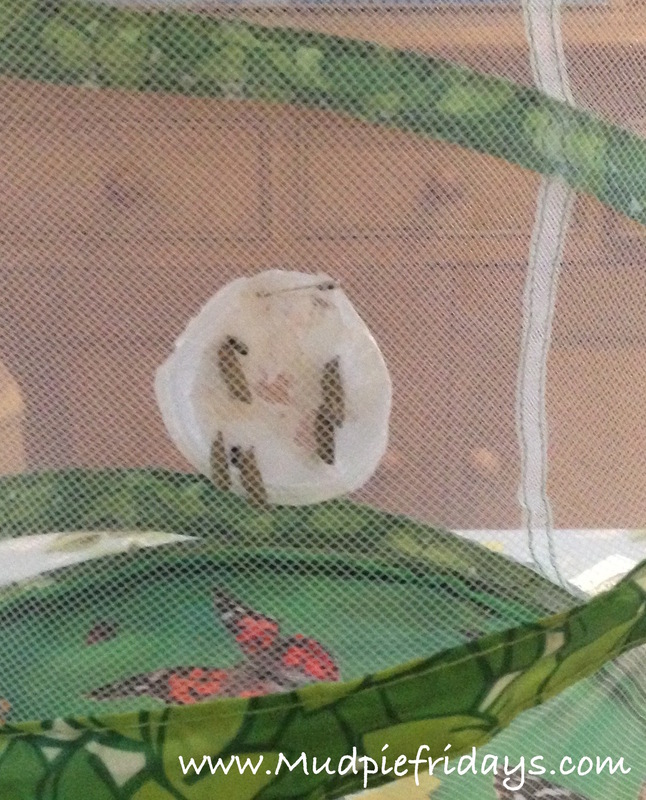 He did insist on feeding them though and we cut up some orange and placed in the bottom of the net for when they are ‘hungry mummy…butterflies look hungry’… We are still waiting for the other three butterflies to emerge, hopefully we will have some more good news tomorrow. 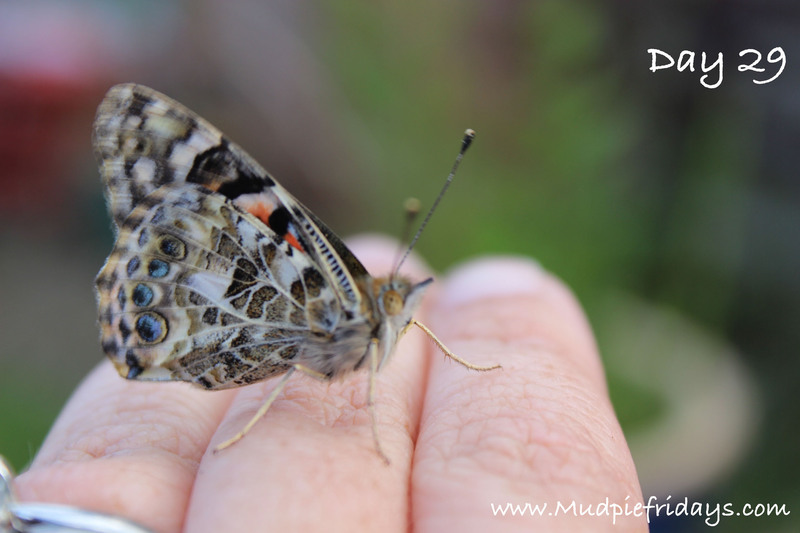 15th June Update – The other butterflies followed in the next couple of days. It was great coming down and seeing a new addition each morning. We would pick flowers in the morning and add some sugar syrup with the pipette which comes with the net. It really helped with teaching Monkey to care for something – even for just a short period, he was really caring towards them which was lovely to see. On the Wednesday Monkey took the net and its contents to nursery to show his little friends. I suspected that one of the butterflies would emerge that day, and true to form it did. It meant that the kiddies got to watch it which was really good. Monkey was very proud when he got home. The last butterfly emerged overnight Wednesday we were hoping that we would be able to let them go on Friday as were were going away for the weekend. We woke up to torrential rain and thought better of it. So instead we released them when we got home a couple of days later. Wow!!! This is amazing!! I so wanna get these!! Yey 🙂 let me know how you get on. Will let you know how we get on 🙂 thanks for stopping by x. Checking back to see how they are! Fantastic post. I’m 100% getting these now! They’re awesome! What an absolutely fantastic thing to do! I should do something like this with my kids. 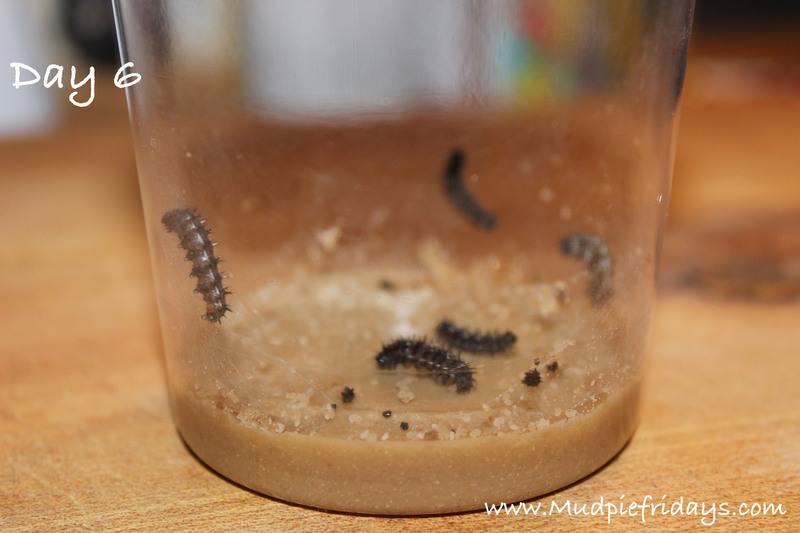 I have to admit I was just as fascinated by the transformation of Caterpillars into butterflies as Monkey was. They looked beautiful afterwards. This is so fabulous! My girls would have loved this so much when they were smaller – and I would too! What an incredible experience, to be able to see the whole life cycle and brilliant for learning about science and biology.